FHS | What Does FHS Mean? 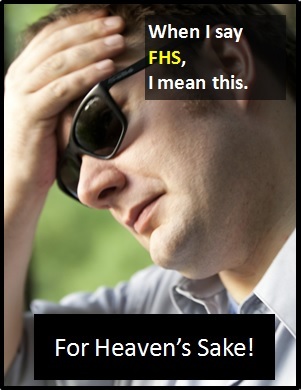 FHS means "For Heaven's Sake".The abbreviation FHS is used as an exclamation of annoyance, frustration or exasperation. Abbreviations with similar meanings to FHS include FCS (For Christ's Sake) and FGS (For God's Sake). All of these exclamations have religious connotations. To express the same emotion without religious inference, you could use FCOL (For Crying Out Loud). FHS shows exasperation or annoyance at someone or something. Tim: Can I have your picture so I can show Santa what I want for Christmas? Sophie: FHS! I've told you so many times! No, I'm married! Amanda: Oh no! I've forgotten my passport. Nick: FHS! You've had weeks to get ready for this holiday!